This is the perfect hardware-free solution that allows you to easily connect and control SiriusXM Music for Business using your existing computer, smartphone, or tablet. Enjoy added features such as Custom Mix so that you hear more of what you want without the DJ chatter across all channels. Use the SiriusXM Music for Business App to change the song selection without interrupting your streaming business music. The easy-to-use Slider System allows you to tailor the “feel” of your station’s song selection with ZERO TRAINING from anywhere in your business. With one touch, you can even make your stream commercial free! No player required! Use your smartphone, tablet, or PC to stream SiriusXM Business into your facility. The fastest way to get started. Sign up, download the app, and you’ll be rocking your business in minutes. Use this exclusive app-only feature to customize channels and create a signature sound for your business. 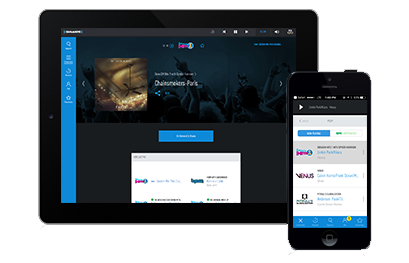 Sign up for SiriusXM Music for Business with Sonu Media, and gain the control over your business music you’ve always dreamed of.